Ok so it's really a DC600X! But the idea behind it was to take everything I love from my (now aging) EBMM and Ibanez Petrucci signatures (control layout, oiled neck, piezo system, locking tuners, ) and combine that with everything I love about my Vader (neck through, bevels, build quality, black limba body) plus some stuff I've always wanted on a guitar (blue quilt top, ziricote fingerboard, walnut neck). After 17 weeks this picture pooped up on the Facebook page. Blown away does not even come close. Hopefully won't take too long to ship. Last edited by Doc_Shred on Fri Jan 19, 2018 11:49 am, edited 1 time in total. Nice. Cant wait to see this one. Congrats! 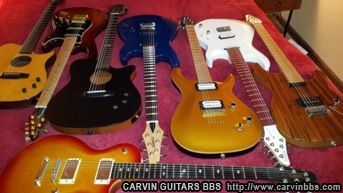 I think it's cool that you are building "your" guitar combining elements of different guitars that you dig. blue candy for the win. its almost a k series at his point. dejabluguitar wrote: blue candy for the win. its almost a k series at his point. I did actually price this up as a K6 as well. Unfortunately because of the initial high base price and VAT/Import duty to the UK it was going to be nearly $1000 more expensive. Looks like no 3PB and only a 1 piece neck instead of the 5 or 7 (whichever it is) that comes with the K series. Even in the US that'd be a couple of hundred dollars. spudmunkey wrote: Looks like no 3PB and only a 1 piece neck instead of the 5 or 7 (whichever it is) that comes with the K series. Even in the US that'd be a couple of hundred dollars. I actually wanted a single piece walnut neck as I think they look great. The 7 piece to match the K would've added $350 and the 3 piece body an extra $150. That's $500 of "extras" I didn't want and if you elect not to have them on a K they don't knock the price down. That is dang good lookin. Can't wait to see more of this. I'm with you on the one-piece neck btw. You get to see more complete grain lines in the walnut than if it was interrupted by bits of other woods.